Ultan Dillane bemoaned a lack of composure in Connacht’s ranks after they were unable to take a famous win in the RDS. THERE HAVE BEEN a few occasions this season when we felt Kieran Keane ought to have said a little more, spoke a little longer in an effort to explain how defeat befell his team. After falling just short of a win away to Leinster yesterday however, staying tight-lipped was probably the wisest course of action. As a team, Connacht did more than enough talking on the pitch, dominating territory through the first half and twice rallying from eight points down to pile pressure on their hosts. 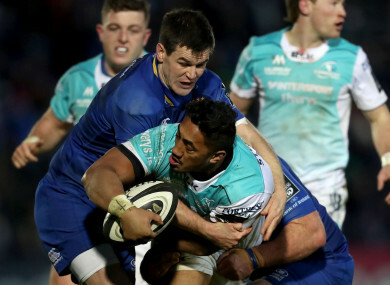 The first of those rallies brought them an 11 – 13 half-time lead, but after 28 gruelling phases in search of a try to overturn a 21 – 18 deficit before full-time, Max Deegan was awarded a penalty that crushed Connacht’s hopes. With Deegan’s knee on the turf as he attempted the poach though, the penalty could have easily been awarded the other way. If Keane felt able t speak more freely on refereeing calls, his view of Fergus McFadden’s collision with Tiernan O’Halloran would have been interesting too. The Connacht fullback was accidentally taken out in the air by the Leinster wing, and the Kildare man was fortunate to escape with only a penalty as sanction rather than a card. “We shouldn’t leave it up to that,” comes the interjection from Ultan Dillane when the last-gasp penalty call is being discussed. “It should be on us to keep our shape. You should never rely on the ref to win a game. It was more heart than brain in the end, we just went for it and lose shape for the last 10 or more phases even. Even in defeat, Connacht head into next weekend’s last round of winter inter-pros in rude health and in excellent form. The dominant display against Ulster before Christmas was shown to be no one-off by their brush with history in Dublin. Munster will be well warned when Keane’s men pitch up in Limerick on Saturday with seven wins from the last 10 keep confidence floating upwards. “Aw, I think we’ve been great,” says Keane, “we’re enjoying ourselves and coming together nicely. Perhaps we’re showing a little bit of style, a little bit of class. No, I think the boys are enjoying it and we’re learning something every day. Definitely, there’s a few people starting to find their voice and getting through tough moments together. From Leo Cullen’s point of view, it was a relief to hold on to all four points and close the gap to Scarlets after the weather conditions closed in and seemed determined to make this a dogged contest when Cullen would have liked his back-line to have a hard track to run on. “You arrive here today,” says Cullen, “and the wind is blowing 45 kilometres per hour, it’s starting to lash rain even though it was forecast that it wasn’t going to rain. I just had a feeling that it was going to be one of those really tight difficult days today. “We looked a little bit flat. It can difficult this time of the year, because we have made changes this week. Connacht have a lot more settled look about them and the way they played. Can you identify these sports movies from one image? Email “'We got away with it,' says Cullen as KK left biting his tongue after loss to Leinster”. Feedback on “'We got away with it,' says Cullen as KK left biting his tongue after loss to Leinster”.